IkamvaYouth reported an 85% matric pass for its class of 2011 in January, but the organisation ultimately measures its impact in the number of learners who access post-school opportunities. 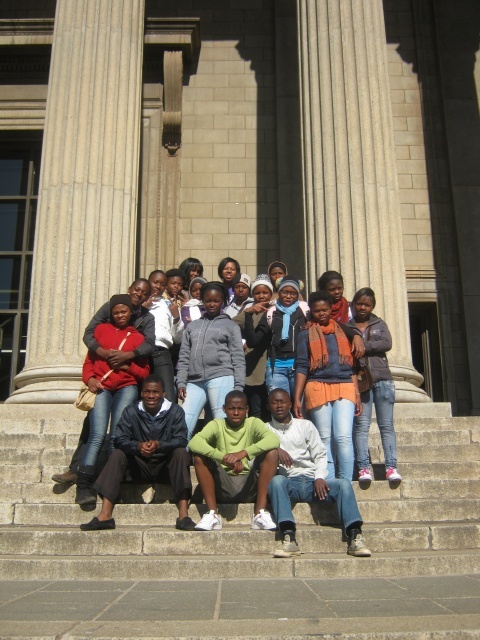 69% of IkamvaYouth’s matriculants have enrolled in tertiary education (including top institutions such as Wits, UFS and UCT), and overall, 97% of those who wrote the matric exams have accessed tertiary institutions, learnerships, employment, or are being supported to rewrite in 2012. 58% have transformed from beneficiaries into benefactors by becoming volunteer tutors and mentors for the next generations of learners. The 2010 General Household Survey found that only 4,2% of South Africans aged 18 to 29 were enrolled at higher education institutions. Whereas 17,4% of white youth were enrolled at university, this was true for only 3,1% of black Africans and 3,5% of coloured persons (STATS SA, 2011). “The nation’s obsession with matric results is misplaced”, says IkamvaYouth director Joy Olivier. “It is only through access to post-school opportunities that the challenges of unemployment, poverty and inequality can begin to be addressed”. 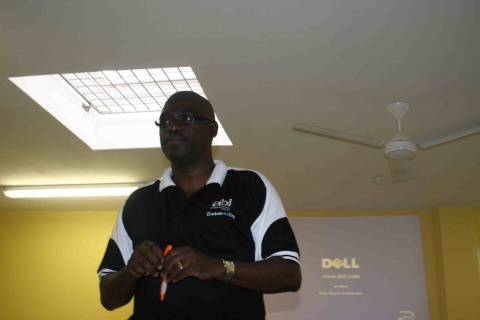 National coordinator Zamo Shongwe points out that “unfortunately, with the system struggling to deliver on the basics of literacy and numeracy, and most parents without the information or resources to assist their children, many young people are left stranded at this pivotal point in their lives”. IkamvaYouth supports learners as they learn about, apply to, secure financial aid for, and enrol in universities, universities of technology, learnerships, internships and jobs. Every year since 2005 ikamvanites have achieved miraculous results, and once again, the low-cost / high-impact model’s effectiveness has been proven. Between 2005 and 2011, 66% of the programme’s 403 matriculants have enrolled in tertiary institutions. Overall, the peer-to-peer academic and social support system has ensured that 77% of matriculants since 2005 have enrolled in education, a learnership or a job 2.5 months following matriculation. One ikamvanite who has been in the programme since 2009 has had to navigate a multitude of obstacles throughout her life including a lack of information, transport restrictions, and financial constraints. Her mother is HIV positive, works as a domestic worker and has brought her daughter up on her own. Now, she is studying for a BA in Human and Societal Dynamics at the University of the Free State on a full academic bursary, awarded by Jonathan Jansen. Anathi Malindi, a Grade 12 from the Nyanga Branch, achieved a Bachelor pass in her exams and is now studying Analytical Chemistry at CPUT. Her mother was “so relieved and happy that her future is brighter now”. The majority of ikamvanites come from homes where one basic income supports an entire family, where unemployment, alcoholism and domestic violence are the norm, and access to university has hitherto been an idealised pipe dream. For ikamvanites it is becoming a reality. 83% of Ikamvanites surveyed in 2011 stated that IkamvaYouth had changed their expectations of what they could become. The fostering of self-belief and the support offered to learners truly allows them to proclaim that “today my life begins” (Anathi Malindi). Placing learners at the centre of programme design and delivery ensures a lasting impact. Vuyiseka Melani, from the Nyanga branch, says “it’s not just the tutoring that makes us attend Ikamva, but the support and the love we receive from all the tutors”. IkamvaYouth works with learners in grades 8 to 12 to ensure that they do not become part of the growing cohort of unemployed and uneducated youth. As each matriculating year exceeds their own and others’ expectations, more are inspired to become volunteer tutors themselves. The organisation’s consistently impressive track record has attracted new supporters, staff and volunteers, enabling the organisation to establish two new branches (Ivory Park in Gauteng and Umlazi in KZN) and enroll 711 learners across the country in 2012. The ikamvanites are inspirational examples of young people becoming agents of their own change and the architects of their own futures. The organisation is calling out to anyone and everyone to join and enable further success breeding success. Join us and lift as you rise! Great news for IkamvaYouth as we become the first South African (and African) organisation to make it onto the WorldBlu-accredited list of the “World’s most Democratic Organisations”. IkamvaYouth is in the habit of performing minor miracles as most of the township high-school learners who join the programme need to jump at least at least 2 or 3 symbols to access quality post-school opportunities when they matriculate. However, it is not just what IkamvaYouth does, but also how IkamvaYouth does it that contributes to its sustained success. For the past 5 years, IkamvaYouth has achieved a matric pass-rate of between 85-100% and over 70% of IkamvaYouth learners have gained access to tertiary education. This is particularly impressive given the prevailing schooling challenges in South Africa and that IkamvaYouth does not have an initial academic entry requirement for learners. A key feature of IkamvaYouth’s achievements is a commitment to inclusive value-based democratic decision-making which has resulted in IkamvaYouth’s inclusion in this year’s Worldblu List of the “World’s Most Democratic Workplaces”. There are 7 township-based IkamvaYouth branches in 3 provinces across South Africa and each branch is run by a democratically elected branch committee (branch-com) made up of committed volunteers and beneficiary representatives. The branch-com is responsible for implementing the IkamvaYouth model and everyone is invited to participate (including parents, partner organisations, learners, and community leaders) in all matters relating to the functioning of the branch. Great emphasis is placed on ensuring all deliberations are open and transparent and all aspects of the local branch are open for discussion including budget allocations and recommendations, hiring and firing of branch coordinators, performance reviews, budget decisions and ideas for improving the core programme offerings. Alongside IkamvaYouth on the Worldblu List of the “World’s Most Democratic Workplaces” is the Fortune 500 company Davita and a number of other well-known democratically structured companies and organisations including Zappos.com, HCL Technologies, New Belgium Brewery, Great Harvest Bread Company and WD-40. Organisations from across the US, Canada, Mexico, the UK, the Netherlands, Denmark, Malaysia, Haiti, India, New Zealand and Singapore made this year’s WorldBlu List from a diverse range of industries including, technology, manufacturing, healthcare, retail, services and energy. The organisations range in size from five to 90,000 employees representing over $17 billion in combined annual revenue. According to WorldBlu founder and CEO, Traci Fenton, this is the most global WorldBlu List to date which reflects an increasing movement towards democracy in how we organise ourselves and find ways to relate better to one another. “WorldBlu-certified organisations model how democracy unleashes human potential and builds highly successful organisations that change the world for the better. It must surely be true that the more young people there are actively involved in value-based democratic initiatives, the brighter the future of South Africa’s own democratic future and aspirations. To mark IkamvaYouth’s inclusion in the list of the “World’s Most Democratic Workplaces”, the IkamvaYouth branches in Gauteng are running a competition for learners and volunteers to submit a response to the question, “What does democracy mean to me?” Learners will be writing essays or employing other creative means at their branches on 10 April 2012 and will be presenting to the group on Saturday, 14 April 2012. Media enquiries or visits to any of our branches on either of these days is widely welcomed. 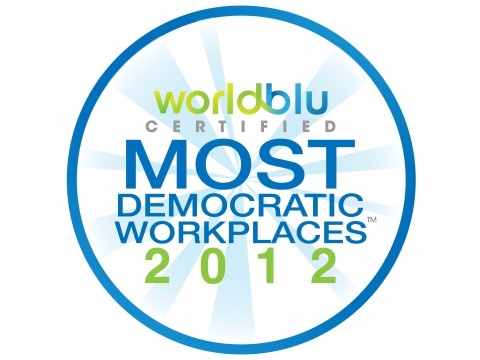 Companies and organisations become eligible for a spot on the WorldBlu List of Most Democratic Workplaces™ only after its employees complete the WorldBlu Scorecard™, an assessment evaluating their organisation’s practice of the WorldBlu 10 Principles of Organizational Democracy™, with an overall combined score of 3.5/5 or higher. The WorldBlu Scorecard™ was developed based on a decade of research into what makes a world-class democratic company. Organisations from the for-profit and non-profit sectors that have been in operation for at least one full year and have five or more employees can apply for WorldBlu certification. View the full WorldBlu List of Most Democratic Workplaces™ 2012 and read more unique best practices from this year’s list at http://worldblu.com/awardee-profiles/2012.php. 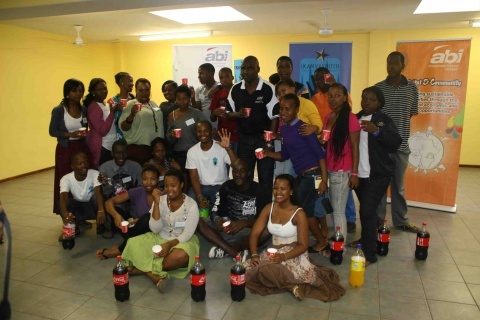 Our newly launched Umlazi branch hosted its first annual open day on Saturday, 14 April 2012. 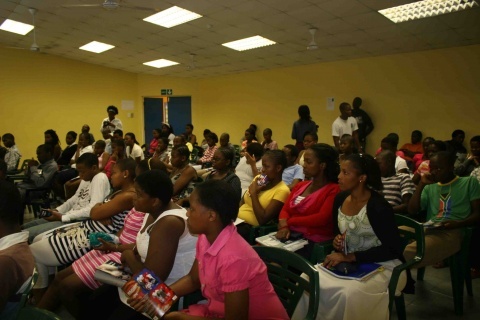 Learners and parents gathered at Umlazi AA Library, where our new branch is located. S’bonelo Cele, Branch coordinator of IkamvaYouth UMlazi welcomed all the learners, parents, volunteers and sponsors. S’bonelo gave an impressive presentation about Ikamva Youth; his opening remarks highlighted the purpose of the Ikamva Youth at uMlazi. “Learners at IkamvaYouth UMlazi will not only be tutored, but they will also get the chance to take part in extramural activities, such as poetry sessions, visual arts and music”, said Cele. Learners also got a chance to watch an inspiring documentary by Anna Telford, titled “Flying Colours”. The film follows Akhona, a young learner who was studying towards her final matric examinations, who was an Ikamva learner and now is at the University of Cape Town. This documentary highlights the challenges facing learners from disadvantaged backgrounds and how Ikamva has helped them to turn their problems into an opportunities. 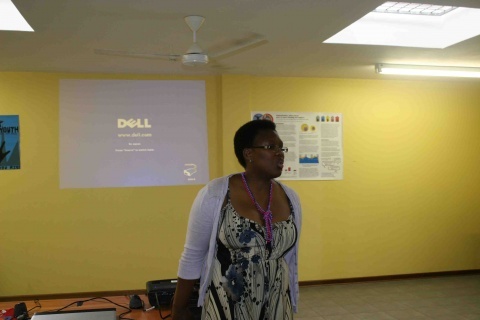 Mrs Teboho Mzizi, the Senior manager of libraries in the Durban area, spoke about the role played by libraries in promoting and supporting education. 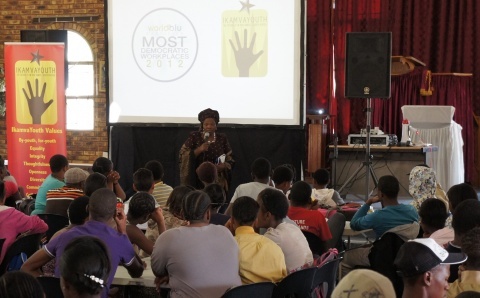 She also spoke about the library resources such as an E-zone and study halls available for learners. She explained the importance of the library membership and how it will benefit them. Mzizi urged the youngsters to take the tutoring seriously as it will help them get good symbols for university entry. 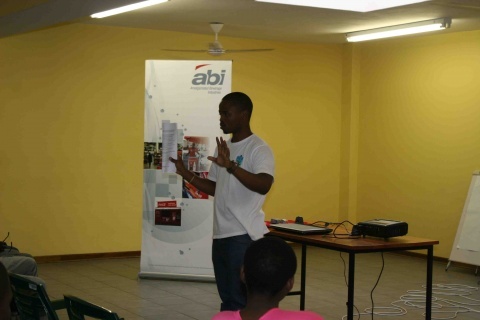 Mr Samkelo Nkosi, from our sponsor ABI, spoke about the importance of organizations like Ikamva Youth and why they support and encourages them. He also spoke about the plan for other IY branches to be opened in future. The previous Ikamvanites from Chesterville branch shared their experiences with Ikamva and tutors as well as how they improved with their skills in subjects like mathematics and physical science after joining Ikamva Youth to the learners. They also spoke about how they were easily accepted at Universities. The potential new learners were then given an opportunity to ask questions about the programme. The presence of parents made the day fulfiling, as some questions came from the parents. Application forms were then handed out to the learners. Learners were also entertained by the poetry and music from our previous Ikamvanites. The day ended with refreshments from ABI, and learners got the chance to meet with the tutors and taking pictures. “Drum Beats……” And the Winner of a New Samsung Phone is Mary Makgamatha who is joined by her colleague Nompumelelo Nkosi in celebrating her achievement. 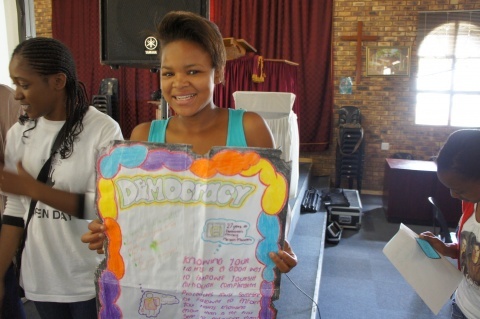 Mary’s poster won in an IkamvaYouth Democracy competition announced in a joint session between Ebony and Ivory Park Branches. The awarding of these prizes took place on Saturday the 14th of April 2012 just after the tutorial session. The competition was open to both tutors and learners. Mary could not contain her happiness when Modjadji handed over the Samsung phone in a box and expressed her gratitude to her colleagues that have encouraged and supported her when she was engaging her creative juices, to produce a story-telling, winning poster. Well done, Mary! IkamvaYouth Gauteng had an extra-ordinary Saturday Tutoring Session on the 14th of April as we took the last hour of the tutoring session to celebrate IkamvaYouth being the first South African (and African) organisation to make it onto the WorldBlu-accredited list of the “World’s most Democratic Organisations”. 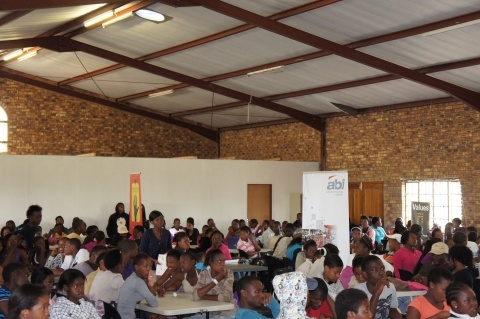 The two branches in Gauteng (Ebony Park and Ivory Park) came together making the venue full to capacity with over 250 learners and over 50 tutors. The celebration was attended by our Guest Speaker Phumza Makanya-Ojowuro, the Director of Employee Relations and Wellness at UNISA who spoke to everyone who was present about what Democracy is and how important it is to South Africa and the world. She also expressed how proud she was of IkamvaYouth and how this is an important announcement to the whole country. To mark the occasion, the IkamvaYouth branches in Gauteng were running a competition for learners and volunteers to submit a response to the question, “What does democracy mean to me.” Learners wrote essays and employed their creative means to answer this question. This day was filled with loads of fun as the winners who entered our competition were announced after Phumza’s Makanya- Ojowuro’s speech. Five learners walked away with airtime vouchers and two learners walked away with a cellular phone voucher each. Our funders African Bank and ABI attended the function with ABI bringing drinks to hand out to everyone who was present at the celebrations. The Tzu Chi Foundation, who have been great IkamvaYouth Gauteng supporters, were also present and brought along their boxes full of apples for all the learners and volunteers.